Fennekin in game: 10,092 Who? Important notice! Pokemon Fennekin is a fictional character of humans. 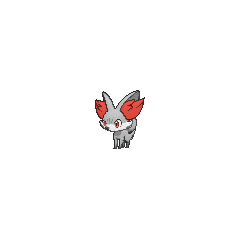 Fennekin (Japanese: ???? Fokko) is a Fire-type Pokémon introduced in Generation VI. 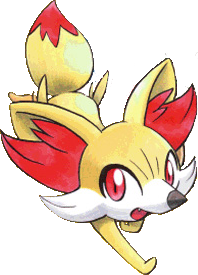 Fennekin is a quadruped fox-like Pokémon. It is covered in pale yellow fur that is longer on its haunches. Tufts of dark orange fur cover the insides of its large ears, and it has a white muzzle with longer fur on its cheeks. Hot air is vented from its ears, reaching temperatures of over 390 degrees Fahrenheit. It has large, dark orange eyes and a pointed, black nose. When its mouth is open, two pointed teeth can be seen in its upper jaw. 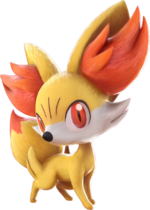 Fennekin also has small paws with no visible toes and slim legs. Its tail is fluffy with a dark orange tip. Fennekin chews on twigs instead of eating snacks. It can be temperamental, but it tries to do its best for its Trainer. Serena's Fennekin first appeared at the end of A Battle of Aerial Mobility! as one of the three Starter Pokémon Serena could choose from Professor Sycamore. 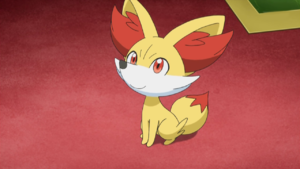 In the following episode, Serena chose the Fox Pokémon as her starter. Fennekin evolved into a Braixen in Battling with Elegance and a Big Smile! whilst battling Aria's Delphox and Aromatisse with Pancham. A Fennekin appeared in A PokéVision of Things to Come!, under the ownership of Aria. A Mirror World Fennekin appeared in The Cave of Mirrors!, under the ownership of Mirror Serena. A Fennekin appeared as a plush toy in A Jolting Switcheroo!. A silhouette of Fennekin appeared in A Frolicking Find in the Flowers!. Two Fennekin appeared in Till We Compete Again!, where one was a Starter Pokémon that was offered as a choice for a Youngster to choose from and one was on a video screen in the Lumiose City airport. Two Fennekin appeared during a flashback in The Legend of X, Y, and Z!, with one being wild and the other appearing as a painting on a wall. In An X-cuse to Come Out and Play, Professor Sycamore gave Trevor three starter Pokémon so that X might choose one and stop his shut-in behavior. 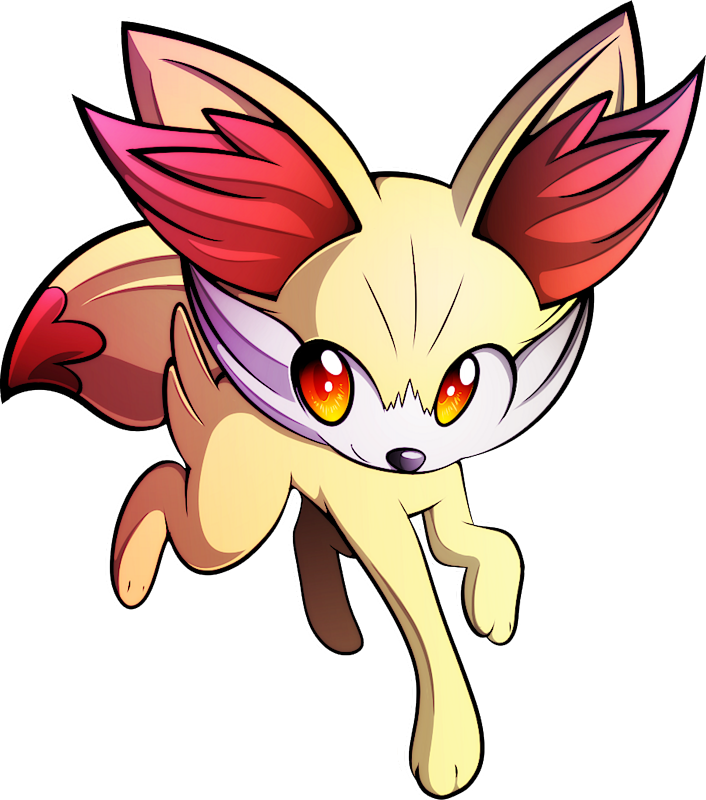 Before it could even get to X, a battle between Xerneas and Yveltal caused Fennekin and its Pokédex to be sent flying and go missing. 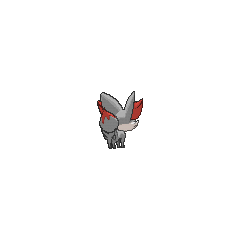 It was later revealed to have been found by Team Flare and was put in a box with other Pokémon from Vaniville Town, taken by Malva who crushed the unneeded Pokédex under her foot. While under Malva's care in an unknown amount of time, it evolved into Braixen. When released from a Poké Ball, Fennekin will shoot fireballs with Incinerate. Enemies hit by these fireballs will be stunned, and will take continuous damage until the fire fades. 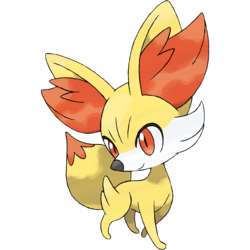 Fennekin is based on a fox, most likely a fennec fox. Fennekin may be a combination of fennec and kindle. Fokko may be a combination of fox, fuoco (Italian for fire), ? ko (fox), and ? ko (child).